The United States won comfortably against an overmatched Nigerian squad. They will face stiffer competition in the knockout rounds. At the end of my analysis of the Sweden game, I referred to an article by Jeff Carlisle, and Jill Ellis could have taken her game plan directly from it. His suggestions were: 1) get Tobin Heath on the field, 2) either Abby Wambach or Amy Rodriguez must start, 3) return Carli Lloyd and Lauren Holiday to their Olympic roles (that is, Lloyd holding and Holiday creating), 4) play at a faster tempo, and 5) better movement off the ball. With the possible exception of improved movement off the ball, the United States made all of these changes. Surely these changes played some role in producing the first truly convincing United States performance of the tournament. Wambach, after all, scored the 45′ goal, and Tobin Heath was responsible for blocking off Wambach’s marker on the play, Onome Ebi, to give her a free run at goal. Heath also made some contribution to the nearly 65% first half possession by the United States, though Holiday and Lloyd’s revised roles were probably even more important. Holiday passed effectively and Lloyd’s coverage of Ngozi Okobi, the creative heart of this Nigerian side, was critical to stifling Nigeria’s counterattack. Nigeria’s best chance came when Lloyd had moved forward into the attack and Okobi played a brilliant through ball past Julie Johnston for the pacey Asisat Oshoala. Johnston’s truly spectacular recovery against a faster opponent underlined the extent to which defense remains this US side’s primary strength, but credit Lloyd for largely stifling the player that had made Nigeria look so threatening against Sweden and Australia. The game was really finished in the first half, and Sarah Nnodim’s second yellow at 69′ made the final 20′ a formality (though credit Nigeria for staying positive, initially in a 4-3-2 and then in an even more attacking 4-2-3). Nnodim was one of three new starters for Nigeria, who had previously not rotated their line-up. The other two newly introduced players had been substituted out at 50′ and replaced by the previous starters, clearly a change that was too late (and probably too little given Nnodim’s ejection). 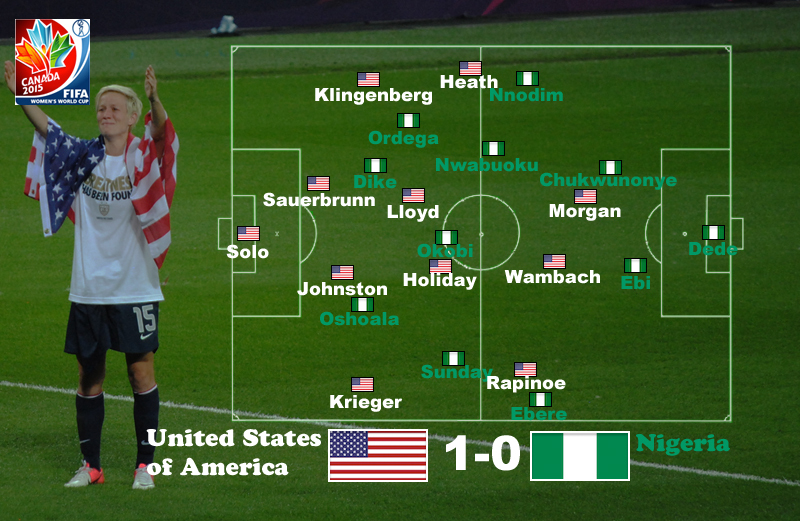 One suspects that Nigerian fitness levels and lack of depth greatly contributed to the US dominance. While the United States looked better than they have in either of their earlier games, the level of competition will only increase as we move into the knockout stage. Colombia will be a more dangerous counter-attacking side than Nigeria, while China will present a different set of issues with their possession-based game. Still, the United States will remain the decided favorites in both of these matches, especially given the defensive solidity on display in the last two matches. Germany or France, however, will be a very different level of opposition, and as yet the United States have not demonstrated an attacking threat sufficient to worry these top sides. Hopefully, Alex Morgan will continue to play herself back to full fitness. Her performance against Nigeria was promising, though she still appears unready to be the primary US threat. Wambach is more troubling given her age, and Ellis will have to weight the dangers of neutering the US attack by resting her or of exhausting her before the end of the tournament (or at least the semis).